For readers who arrived via the What My Child Is Reading blog hop, just a quick explanation - with Ramadan coming up soon, I'm focusing this post on Ramadan-related picture books. They can be hard to find, so I thought other Muslim moms might find these reviews helpful. But sorry if this list is a bit too narrowly-focused to be much use to moms of small book-lovers in general! 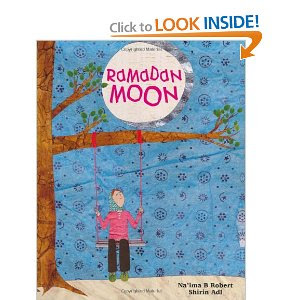 By far our favorite of the Ramadan books I've found so far is Ramadan Moon, by Na'ima B Robert and Shirin Adl. The illustrations are simply beautiful, and there are lots and lots of details to look for and talk about, which is always a hit with Basbusa. The front cover isn't as enchanting as the illustrations inside. Will all stand up to pray. Upon hundreds of years ago." For a toddler, I think this kind of description is much more meaningful than a selection of ahadith talking about the rewards and benefits in very complicated language. "In daylight, we feel hungry. It truly captures the joy of Ramadan as it's really experienced. It conveys the sense of being part of a worldwide community and of a family; it makes the connection to the waxing and waning of the moon; there's a page showing a street alive with people in the evening, just like you'd see in Cairo during Ramadan, for example. There are people going to Tarawih, but there are also kids playing in a playground, people eating in restaurants, etc. Basbusa loves the Eid page because she likes all the pics of tasty food and pretending to eat it, but she likes the whole book, really. We read it four times in a row the first time around, and many many times since. 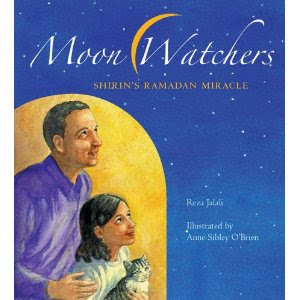 I also really liked Reza Jalali's Moon Watchers: Shirin's Ramadan Miracle, but I think it will be more meaningful for Basbusa a few years from now. I loved the close family relationship it depicted, of happy Muslims in the living in the West. I loved how the little girl can't wait to try fasting and sees it as something beautiful, and how she tries part-time fasting since she's too young to fast completely. "As Mom stands and sits, the soft cloth catches the breeze. She looks beautiful. Later, I ask, "How come you don't always wear a scarf like Maman-Borzog [her grandmother]?" Mom laughs and says, "You know, not every Muslim woman covers her hair." "But in the pictures Auntie sends us she always wears a scarf." "In her country it is the custom. There are different traditions about such things. But all Muslims use the same prayers and we all observe Ramadan." I do think that all Muslimas should wear hijab, but I really don't like how the whole scarf-or-no-scarf issue is made into such a huge deal, both in the US and elsewhere. "What's she wearing? Oh, she must be _____. All covered up? Oh, she must be_____ . A niqab? Oh, she must be _____. And most of all, "She doesn't cover? Oh, well then, it's obvious, she must be _____." I can't stand this kind of thing, whether the assumptions being made are positive or negative. Wearing hijab is important, but it is not one of the five pillars of Islam. I know some amazing Muslimas who don't wear a scarf and it drives me batty to hear people just dismiss them as "not good Muslims" just because their hair is showing. Plus, in the US, the question of Muslimas who don't cover is definitely going to come up in Basbusa's mind eventually, and I'm going to have to answer it somehow. My explanation won't be exactly the same one as in this book, but the tone of inclusiveness and tolerance, in conjunction with the message that covering or not covering does not equate to "good" or "bad" Muslim, is just what I'll be aiming for. 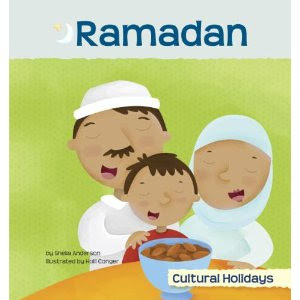 I was not so keen on Ramadan, by Sheila Anderson (it seems to be part of a series for kids on "Cultural Holidays.") It's non-fiction rather than a Ramadan-related story book. Basbusa enjoys some of the pictures, but the text (in my opinion) is dry and boring. Plus, it's slightly incorrect in some places (for example: "In the evening, people wait for the moon to be seen. Then, they can eat and drink again.") To judge by the names of those involved in writing it, none of them are actually Muslim, and I think it shows: although almost all the facts are perfectly correct, the joy of Ramadan doesn't come through at all. 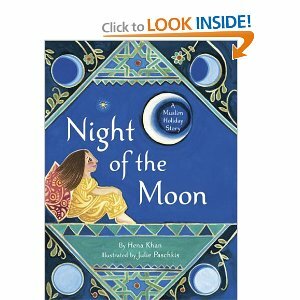 And finally, we read Night of the Moon by Hena Khan. It has lovely illustrations, but they're not the kind that easily allow Basbusa to piece together a picture of what's happening in the story (which is probably too complex for her to grasp anyway, even in a general way). But this book is also an example of the kind of approach to Ramadan that I'm not so keen on, focusing on the more secular aspects. ("Yasmeen had been looking forward to Ramadan. It was a time filled with delicious foods, new clothes, lots of parties, and her favorite thing ever - presents!") I'm all for sharing the joy of Ramadan, but I think kids will appreciate those parts of it without help :) And they're not what's really important about the month anyway. Does anyone else have suggestions for good toddler-level Ramadan books? I'd love to hear them! 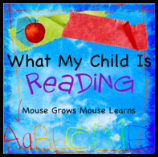 For more suggestions and reviews (for kids books in general, not specifically for Ramadan), check out the weekly blog-hop at Mouse Grows, Mouse Learns. She has a vague grasp that Allah made everything. I don't think she has really generalized to "everything" yet, but she knows that Allah made her nose, and the freckle on her leg, and our food and drink, and the sun and the moon, for example. She knows about saying "Al7amdulillah" and "yr7mkum Allah" when someone sneezes. She knows half the letters of the Arabic alphabet. I'm not rushing on those so much any more - I've seen that she can pick them up quite easily and enjoys it as a game, but I don't want to make a big deal of the alphabet as something she feels she "should" know or is "expected" to remember. She knows all her colors. She knows all her shapes (even more obscure ones like crescent, diamond and oval). She knows that words on the page "say things" and follows them along with her finger as she makes up text. She recognizes the numbers from 0 to 9, more or less. Kind of. Not super-reliably, though, and she doesn't have much clue what they actually mean. She knows what numbers to press on the elevator for friends who live on particular floors of the building, and she knows what one, two and "half" mean, but as for counting larger quantities, she's not quite there yet. She can count to six quite well, and sometimes makes it to ten. She's getting quite good at using a glue-stick and making collages (we haven't tried messier glues yet!). Sorting: none of the tot-school activities I used for this really attracted her, and she didn't really get the concept. But she's now sorting spontaneously by color or by size in real life, so that will do fine for now. I'll get back to it a bit later when she might be ready for more complicated kinds of sorts, but for now I'll use that tot-school-preparation-time for making other kinds of materials. Fine-motor skills: these were some of her favorite tot-school activities, but in reality, she does almost nothing else all day long, in everyday life. She loves screwing and unscrewing things (jars, toothpaste, bottles, nuts and bolts), peeling things (garlic, bananas, any kind of sticker), pouring things, and stirring things. That's another area where I'll save the time on making tot-school materials and spend it on other areas instead. My darling Basbusa turned two a few weeks ago. I can't believe how time has flown, and how much she has grown and changed over the past two years, masha'Allah! She's the light and joy of my universe, and every day she lives, her company becomes even more fun and more interesting. She's such a blessing, al7amdulillah! At two, Basbusa can say pretty much anything she wants to say in Arabic. She can explain all kinds of complicated ideas about the past, the future, and about how things work, and picks up new words at the speed of light, masha'Allah. (I know all toddlers do, but it still never fails to amaze me that I can tell her words like "walrus" or "dome" just once, and hear her remember them perfectly weeks later.) She chatters all day long, and there's nothing in the world that I enjoy so much as listening to her plans, opinions and explanations! She is absolutely crazy about books, and reads them all day long. She even likes to sleep with her favorites sometimes. It's interesting; all of a sudden a few weeks ago, she has started to show a very clear preference for longer picture-books with more complicated plots, rather than the board-books she has loved for so long. She still looks through them occasionally and enjoys them, but rarely goes in search of them any more. Overnight, she seemed to reach a point where she loves books with characters having experiences she can relate to, and follow through the courses of their adventures. In most picture books, some of the details of the plots are still over her head, but she gets the general gist, and loves reading them over and over again until she can "read" them back to you. She's also making all kinds of connections between things that happen in books and things that happen in her own life, and between similar or different occurrences in two different stories. Also quite suddenly in the past week or two, she has jumped into imaginary play. In a picture book showing bears in an icecream shop, and she spends ages pretending that we're in the shop too, picking out which flavor she wants to eat, asking the sales-bear to give it to her, pretending to eat it, asking me which one I'd like and "buying" it for me, etc. In the car the other day, she was playing with a flash drive, and within the course of fifteen minutes it became a camera that she took pictures with (admiring herself in each "picture" after taking it), a phone to talk on, a Quran she was reading, and a bottle of juice she was drinking. She also has all kinds of adorable one-sided "conversations" with her friends and family while she's pretending to talk on my mobile phone. It was an amazing transition to watch: One day, each thing had its own name and purpose; the next day, her imagination had opened up a thousand possibilities. She loves playgrounds, beaches, the garden and her paddling pool, but she's still a little more on the cautious side when it comes to gross motor activities, especially if they're new to her. She loves bugs. Almost nothing is as fascinating as watching ants and spiders, and she's intrigued to watch them running around on her hand when she can persuade them to climb up on her (which she does with great enthusiasm: "يا نملة! يا نملة! تعالي! اطلعي! اطلعي على عيدي!"). She very much enjoys spending time with her three "best friends" (two little girls and a little boy, all almost exactly the same age as her). She still has a long way to go in terms of the whole "sharing" and "taking turns" concepts, but I can see her getting the hang of it more and more each week. After these visits, she talks endlessly about who she played with, what they said, what they did, and what their mothers said in reaction :) She doesn't run to make friends with new kids in the playground, but she watches them in fascination, and is starting to interact with other toddlers without being encouraged to. Long silence, back at last! No posts since April! The last few months of being a working mom just got too hectic, but now, al7amdulillah, I have the glorious luxury of being a SAHM to Basbusa (and, in a few more months, her little sister insha'Allah), so more posts will be coming right up. The first few might be interesting more to me than to anyone else, because my sweet Basbusa just turned two, and I want to write a few posts on what an accomplished and entertaining little person she has become, masha'Allah. But I also have a post on the way reviewing the Ramadan story books we've checked out so far, plus one on all the tot-school Ramadan ideas I have planned. So, please check back over the next few days; new content is on the way insha'Allah!